Cut beef into pieces, wash well and keep it aside. Heat a pan and roast coriander powder, chilli powder and turmeric powder for 2 minutes. Then marinate the cleaned beef with the roasted powders and salt for half an hour. Grind fennel seeds, pepper corns, cinnamon, cardamom and clove together to a powder and keep it aside. Heat 2 tbsp coconut oil in a pressure cooker and splutter 1/2 tsp mustard seeds. Add coconut slices, sliced shallots, crushed ginger, coriander leaves and curry leaves and saute well. Add marinated beef and 3/4 cup water and mix well. Cover and cook till done. 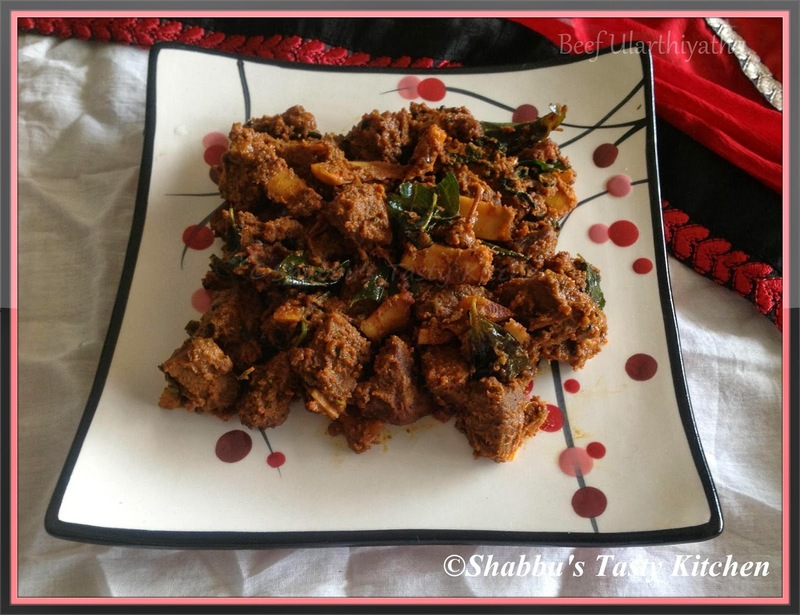 wow tempting...my all time favourite!beef ularthiyathum kerala porottayum!!!!!!!!!!! Love this spicy dish but we don't eat beef. I shall try with mutton instead.